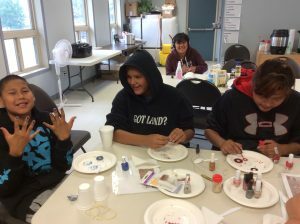 The mission trip to Weagamow, Ontario was a new adventure for Church of the Rock as no team had ever been there before. The team consisted of 6 people, led by Pr. Keith. Each campus was represented in the team. 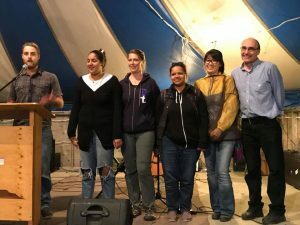 The purpose of this trip was to connect with the youth and young adults in the community and to minister in the tent meetings of the 35th Annual Church Conference. After a 16 hour drive in the church van, with 5 hours on gravel, the team arrived in Weagamow. Our hosts, Ivan and Fay Wapenisk warmly welcomed us to their community. Each evening, the team members hung out at the recreation centre with a number of 10-30 year olds. On Saturday, the team hosted a bonfire and marshmallow roast at the local recreation centre, and about 12 youth joined in the fun. One of the team members even joined the girls’ ball hockey team for practice. 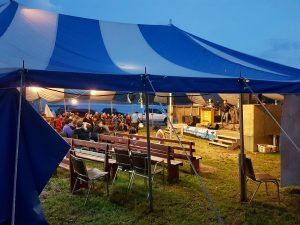 During the tent meetings, Pastor Keith Eberhard preached each evening, and a number of musical guests played as well. The local church was greatly encouraged by our presence in the community. After the sermons, the team went into the congregation to pray for people and many people were ministered to in a variety of ways. A number of people were healed and others accepted Jesus or rededicated their lives. The women on the team led a crafting session and Bible study with local women. The women connected well and many new friendships were developed. Some of the people from the community were interested in the tent meetings, but felt unable to enter into the tent and stood around the outside in the darkness of night. Interacting with these people was where much prayer and encouragement happened as well. The local church made a card and took a goodwill offering for one of their own who is in a hospital in Winnipeg. One of the team members was able to bring the gift to her on behalf of the community. The first trip to Weagamow was a success, as many lives were touched by God.